Chemtrails are not real, but that hasn’t stopped an increasing number of Americans from thinking they are. Research by Harvard scientists published in Palgrave Communications on Tuesday shows that a shocking number of people believe the batshit theory that the government is secretly spraying chemicals in the sky to control the weather or our minds or whatever. The scientists polled 1,000 people ahead of the U.S. election. They found that 10 percent of respondents think the chemtrail conspiracy theory is “completely true” and 20-30 percent think it’s “somewhat true” (the range is because they asked people for a “best guess” as a follow up). That’s the equivalent of 120 million Americans in the “chemtrails are real” camp despite the reality that they are most definitely not. The research was done so scientists could understand public attitudes around geoengineering, an actual technique—albeit a risky and controversial one—that scientists are considering to cool our rapidly overheating planet. Instead, they found that a huge chunk of the population believes a crazy person explanation for the streaks in the sky that follow jets. The real reason those streaks exist is water vapor from burning jet fuel getting super chilled and clings to little particles to form ice crystals. Oh, and they’re called contrails. Meteorologists have tried to stamp the conspiracy theory out of existence for years. But the percentage of people giving the unfounded idea credence has increased from just 16.6 percent of respondents in a similar survey in 2010 to its present high-water mark. In our new media ecosystem, chemtrailers have more avenues to spread their messages, and more ways of hermetically sealing themselves into communities that believe it’s true. Take Twitter, a cesspool of misinformation where 300 million people inexplicably spend time. There, the crackpot theory dominates discussions around geoengineering, a topic that we need to be rationally discussing in the context of climate change. 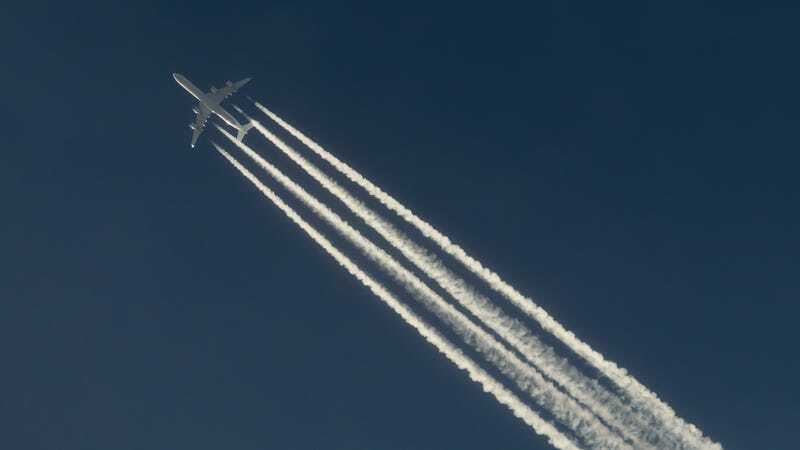 The analysis found that found 59 percent of tweets over the past decade about geoengineering were just conspiracies about chemtrails. Neutral reporting about actual science accounted for just 3 percent of the discussion. The right-wing media ecosystem, with the likes of Alex Jones (who was a common source of discussion on chemtrail Twitter according to the results), has also fanned the conspiratorial flames. But in an age of high polarization, chemtrails also appears to be one thing that unites the political parties. The analysis shows chemtrail believers came together in hoping Trump’s election would finally stop the spraying (sadly for them, they’re still waiting). The analysis also shows chemtrailers discuss conspiracies from across the political spectrum like Hillary doing Benghazi to Monsanto creating mutant plants. The list of interest also inexplicably includes “interior design,” which hey, I’m looking to update my living room decor so get at me, chemtrails people. “The chemtrails angle emerged largely for two reasons: it’s a noticeable phenomenon, even without looking at the data, death threats and all,” Gernot Wagner, an economist at Harvard who wrote the study, told Earther. “It jumped out once we did analyze the data, in particular the social media figures. Wagner undertook the research as part of a project he’s working on at Harvard focused on how feasible geoengineering actually is from the technical, ethical, political and economic standpoints. The basic idea behind the project is to look at injecting particles into the stratosphere to block some of the incoming sunlight, helping cool our rapidly overheating planet. 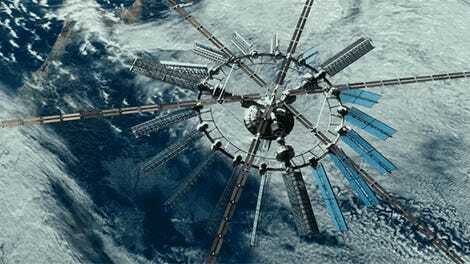 Right now, it’s a dystopian science fiction solution to climate change. But as the planet continues to warm, weirding the weather and causing a host of other knock-on impacts, society needs to have a handle on what our options are. That includes figuring out how to cut carbon emissions—including from planes no less—and if geoengineering is safe but not worrying about fake government mind control programs. While Wagner said he’s hopefully the election was the peak of chemtrail fervor, I’m not so confident. From Pizzagate to the Russia investigation, the U.S. is splintering even further into communities that can’t agree on a shared set of facts. I can’t think of a reason why chemtrails would be any different.